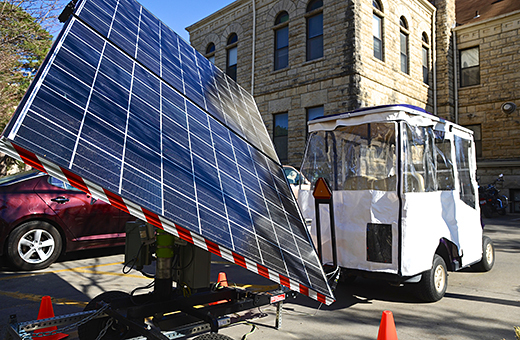 Parker Robb | The Collegian The The Student Access Center, the Office of Sustainability and a local Manhattan inventor recently joined forces in order to provide a golf cart that is powered by the sun to transport disabled students around the K-State campus. The detachable solar panels, unlike conventional solar panels, follow the sun in order to collect the maximum amount of energy possible. The Student Access Center, the Office of Sustainability and a local Manhattan inventor all came together to help disabled students on campus by purchasing a golf cart that is powered by a portable, solar panel device. The golf cart transports disabled students around campus and carries tests taken in special accommodations facility back to professors. Each entity played a key part in making this happen. The tracker on the solar panel device, called the Konza Portable Solar Tracker, was invented and patented by Mark Moser, a Manhattan local. The tracker is part of the solar-powered device, responsible for moving the solar panels that power the cart. What makes this tracker different from its predecessors is that it is fully automatic and completely portable. Moser’s design allows for a much wider range of motion than most other trackers. This allows the tracker to follow the sun anywhere in the world, and not get confused even when the sun passes overhead. “This tracker could actually sit on the north pole and just follow the sun 24/7, all day long, and the other trackers can’t do that,” Moser said. This means that the tracker does not have to be re-oriented towards the sun after twisting to catch it, making it much easier to use. “There shouldn’t be anything for my customers to do to keep it running,” Moser said. The portable tracker was purchased by the Office of Sustainability with money from the Green Action Fund, which is funded by SGA and the Student Centered Tuition Enhancement Fund. Ben Champion, director of sustainability, said the Green Action Fund was created to show students what support for sustainability could do. “This project is an example of a great many types of things that could be created (through the Green Action Fund),” Champion said. Currently, K-state does not have upfront fees for sustainability initiatives, and Champion said he hopes that can change as student support increases. In addition to finances, sustainability takes into account the well-being of people and the well-being of environment in judging quality of life. “Pure financial metrics is not a judge of complete holistic health of society,” Champion said. This has direct impact on the agricultural base in Kansas. Champion said investing in renewable energy is something that just makes intuitive sense to people in Kansas. These two camps are not fundamentally opposed, and products that can address the needs of each like the Konza Portable Solar Tracker can be a benefit to both causes. “(Konza Portable) Solar Tracker could probably have some technological applications in a farm setting, that’s great,” Champion said. Andrea Blair, director of the Student Access Center, applied for the funds to replace the gas-guzzling van the Student Access Center had been using for the past 25 years. Blair said that the golf cart is working out better than she could have hoped. The previous van cost an average of $500 on gas per month, using 170 gallons of fuel. The solar panels arrived in March, so Blair is still brainstorming ideas for how they could be used. She said the golf cart might help with Wildcat Walk and that the solar panels may be able to charge amplifiers or neon signs for student events. Blair said she is excited however it is used to help students. “Knowing that other campuses use golf carts, and being an environmentalist, it was an exciting adventure, heartwarming to see it come to fruition, and I want to get students involved,” Blair said. Interior architecture and product design students are doing just that under the guidance of assistant professor David Richter-O’Connell, who Blair said plans to develop a design project around the golf cart. “I contacted David and he was very excited for his students and the possibility of creating some design to be part of the tracker,” Blair said. Whatever the design students create will be seen as the cart moves throughout the K-State campus. Blair said that she hopes the portability of the tracker will get students more interested. “It’s there, it’s the visibility of it in engaging student’s awareness and interest,” Blair said. These three entities came together in this initiative, each with its own distinct mission. They collaborated to help the student body of K-state, as well as help each other. Blair said she would love to have students work with the solar-powered golf cart to figure out how much energy it uses, how long it can stay in the shade, and so on. President Myers has a new purple ride. Have you hitched a ride yet?